OK here’s the thing – I have loved everything I have tried from Deciem. Grow Gorgeous, Hylamide, Hand Chemistry etc – all excellent. There is no doubt in my mind that Brandon, the founder, is at the forefront of science in products and he talks in a way that very few people I have met in the industry talk. Passionately, intelligently and with love and excitement. Being the total gent that he is, he entertained my impertinence. 1. If you’re going to use 1 product from NIOD, use this one. 2. It focuses on skin health and not lines/wrinkles or specific signs of age. 3. It has a very high long-term value to the skin. 1. If you’re going to use 2 products from NIOD, MMHC should be the second one. 2. It shows visible results faster than CAIS. 1. Use only if skin has lost hydration. I do not believe in hydration when it’s not a necessity. 2. Seals in supplemented and naturally-present NMF instead of “hydrating” the surface. 1. Is not meant to targets signs of eye aging that are common to the rest of the face. For these signs, CAIS and MMHC should be used under the eyes as well. 2. FECC focuses largely on eye-area-specific aging including puffiness, darkness and fine dynamic lines. Deeper lines cannot be fixed topically except when they’re static which MMHC will help with. Hollowness also cannot be fixed topically (except with temporary topical filling-type spheres which offer very minimal improvement for a very short time). 3. Is low in viscosity. 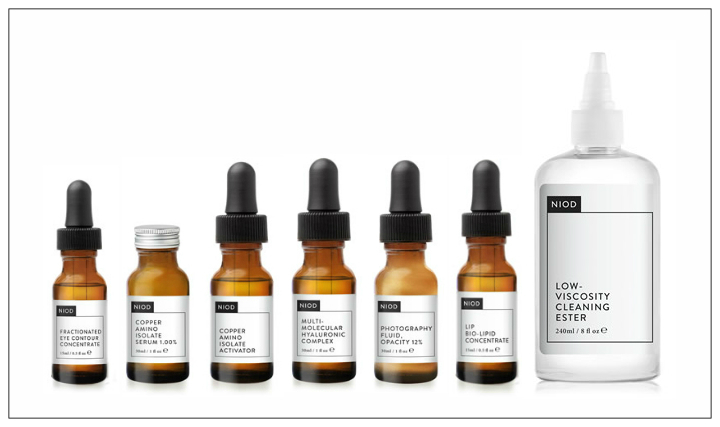 NIOD is absolutely against eye creams. They do not absorb well and actually cause water retention/puffiness. 1. Is not part of the core NIOD regimen. It should be used at nighttime only. 2. Is for those who are educated and users of topical Vitamin C.
3. It’s 30% Vitamin C in a stable antioxidant network that is more advanced and 5% more concentrated than Hylamide C25. 1. Dissolves impurities instantly without water. 2. It’s ideally wiped and rinsed to allow for a single-step cleaning. 3. Leaves a comfortable ester cushion on the skin. This will not clog pores and will help everything applied to penetrate better. If left alone without other topical treatments on top, this cushion will disappear and actually balance (not trigger or reduce) natural sebum production. 1. All you really need is CAIS for skin health and quality. The other products are basically better forms of skincare but CAIS is care for the skin’s health. PHEW. Right. Now that I’m a lot clearer, I’m off to get it all on my face again. Next Post 12 Days of Giveaways!